his is Craig Oldham’s labour of love. Curated and designed by the designer himself, In Loving Memory Of Work marks the 30th anniversary of the miners’ return to work and is a vital re-appraisal of the collective aesthetic of one of most important social and political events in recent history. Bringing together myriad political graphics and cultural ephemera alongside first-hand testimonies, In Loving Memory of Work celebrates the creativity of the working class and is one amazing thorough visual record of Britain’s longest ever industrial dispute: the 1984-85 UK miners’ strike. Printed in the UK and published by Oldham’s own imprint (Unified Theory of Everything), the book’s high-production values are evident throughout. 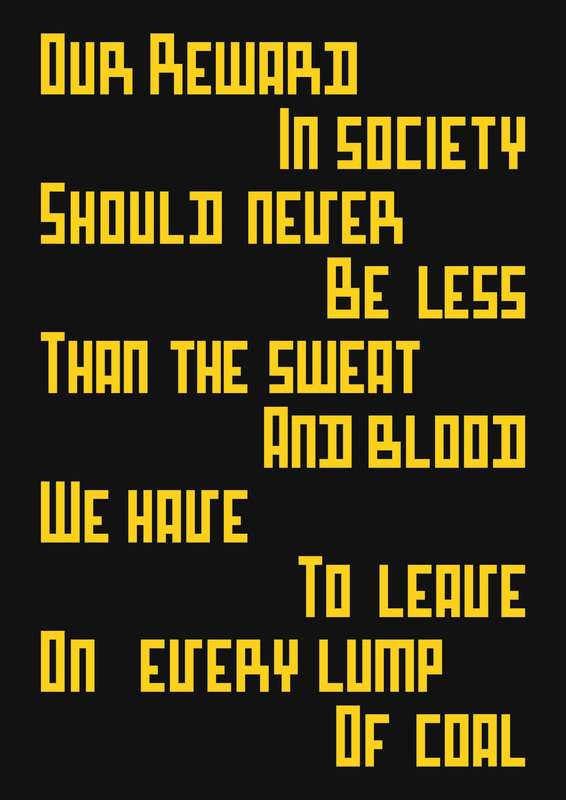 Oldham also collaborated with designer Aaron Skipper, to create a pair of unique, commemorative fonts for a publication that has a social cause (proceeds from the book will go towards the Orgreave Truth and Justice Campaign). “Born in the mining town of Barnsley, just weeks after the formal end of the miners’ strike, it’s hard for me not to have been influenced by those events. After all, three generations of my family had worked in Barnsley pits. As I grew up, and as my parents and their community adjusted to the closures, it was impossible to avoid a certain amount of cultural fallout. Everyone, it seemed, had a story to tell. Funny, tragic, or just plain interesting, these stories (recounted by relatives, neighbours or friends) described the broader narrative of the miners’ strike—a narrative that, over time, created a curious backstory to my own life” explains Oldham in the book. We asked him more on this labour of love of his, on “this story that he is enormously proud to tell”. A story that needs to be told. The book was started in late 2013 through a discussion with a friend of mine about the (then) upcoming 30th anniversary of the UK miners’ strike. As the project developed, I wanted to incorporate an honest and rooted design element in the fabric of the book rather than just showcasing the material. I’d come across the Liaison placards during my research and been struck with their distinct design and visual cut-through, and decided to use that as inspiration and create a font for use in the book. How involved were you in the process? In making the font, apart from starting the process, I art directed and drew the initial raw materials to act as a base for the full design. Then working with designer Aaron Skipper, we collaborated using Aaron’s experience in font creation to get the design to the final stage. There were some tricky decisions to make as obviously we didn’t have the full character and glyph set at our disposal to digitise so we had to employ a bit of creative license in essentially creating from scratch the numerals, glyphs, and certain characters. We also decided that hairline glyphs (which I’d used in a previous project, The Democratic Lecture, with the typeface Jean-Luc by Atelier Carvalho Bernau) would give the font a more contemporary edge and they also added to the unique personality of the font too. We named the font Liaison after the organisation who created the placards and it will be available soon. What was the most challenging and difficult part in bringing the In Loving Memory of Work to life? Creating the coal dust jacket for the book was extremely challenging. Asking a printed to feed a combustable material through a hot machine was met with scepticism and trepidation—and of course that’s right to do so. But once we’d found the right people who would give it a go, it was simply a case of refining on press… which sounds a lot easier than it actually was. Do you believe graphic designers and typographers alike must be political in their vision? I don’t think that it’s necessary for designers to create or do political work, but I think everyone should have a political viewpoint personally. And if that manifests itself through work, then that’s the choice and prerogative of the individual. But design will never change politics, the politics will be the leading factor first and foremost, design can only help communicate the politics really. This area of design—call it graphic political dissent, for argument’s sake—creates some of the most intelligent, witty, creative and powerful work through the widest variety of means much more than commercial or cultural work. How important is typography in getting the message through? It’s rooted in the subject matter. It comes from the time and the place and is a visual testament to a part of the struggle it was born in. The other typefaces used throughout the book were both employed during the time (AGBuch was used in NCB material and the typewriter font was used by those who didn’t have much more than that to create their pamphlets and productions). So the typography is part of the story telling, it’s part of the being. I’m not saying that all typography is arbitrary—of course there are major and definitive decisions made concerning the type in a design—but in the case of In Loving Memory of Work, I really wanted every aspect to have a reason for being, one that was another layer to the content and subject matter, and not simply there to dress up the information. When did you first acknowledged the power of political graphics? I was exposed to the power of political graphics during my education. I always remember the political work of Milton Glaser, David Gentleman, Ken Garland, Emory Douglas and many more. Artists too like Jenny Holzer, Keith Harring etc. As aforementioned, I loved their power, their clarity, and of course they have an opinion. Which is the single most powerful protest poster you ever encountered? That’s a pretty complicated question with no real answer, as each of the causes is relative and so cannot be judged beside one another really. I think the single most powerful body of work, is maybe that of Emory Douglas for the Black Panther Party and other causes. His distinct artistic style and use of imagery and illustration ties the most complicated and simple messages over a great period of time and over numerous causes to create a distinct and unified body of dissent. He was also on the ground and active in his views and politics, and not simply an artist sharing the belief and cause, but actively pursuing it through other means alongside his communications. So that’s a difficult question, but there’s a bit of an answer. The poster is clearly just one of the many creative tools to shape public opinion and exert pressure on policy-makers. Do you believe that in an age of social media, posters have become redundant? No. Not one bit. The poster is immediate and has been with us for centuries. It will always serve a communicative purpose. Social media just gives it further influence, as usually, it’s a picture of a poster that’s shared. Which is the necessary role of the graphic design? To attract attention or to inform? I wouldn’t say attract attention, but I would say engage. And it’s role is both. You come from a mining family yourself. How personal is this project? Obviously as a result of my personal connection it’s very personal. The strike affected my family every-day, and has continued to ever since. I was a strike baby and this is my way of continuing that discussion and doing my bit to bring it towards the forefront again. What would you like to achieve through this publication? A re-appraisal and long-time-coming acknowledgement of the creativity of the untrained designer and the working class. And an underlying message that creativity comes from having something to say and saying it in a relative means and content. In the miners’ strike, creativity was a means not an end, and that is something I think today we can learn from. You are an advocate of political rights. Please tell us more about the organizations you support. I have political beliefs and opinions, but compared to many political people out there I would be wary of referring to myself as a true advocate. I have been on demonstrations and such, but I know of many, many people who do more than I. I support the Orgreave Truth and Justice Campaign through the book, and I also support other causes and organisations also. But as I say there are people who are more worthy of the title of advocate for political rights than I.